The Sport Fisher kayak, in its understated shade of olive green, by Lifetime is the most versatile fishing kayak out there. Thanks to its uniquely designed tunnel hull, it enables you to fish standing up or even sitting in a side-saddle position without overturning the boat. Seating up to three people (500 lbs. carrying capacity), this comfortable vessel works for solo, tandem and family ventures equally well. The ergonomic seating is designed so that the kayakers sit higher than the kayak floor, safe from stray water. Several footrest positions are included to enhance the seating experience. Molded paddle clips and cradles on both sides, front and back hold the paddles as you focus on the fishing. It comes with 4 fishing holders for added convenience. There is a 6 inch storage hatch at the back, shock-cord straps and ditty trays to hold loose accessories, as well as scupper holes to make sure that water doesn’t accumulate in the cockpit. 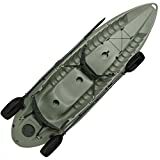 With a length of 10 feet and width of 3 feet it can easily fit two adults and a child in its interior when it’s a leisure family trip or two adults when it’s a fishing trip (for easy line casting and not due to overloading). 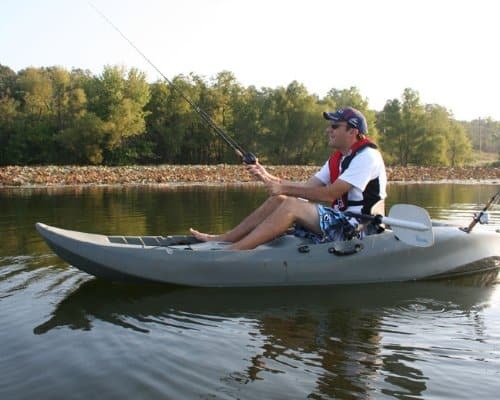 This kayak is extremely stable because of the high density, ultraviolet protected polyethylene body and well-designed hull that provides great tracking as well. This kayak weighs 60lbs. and comes with molded handles at the back and front so two people can carry it easily. 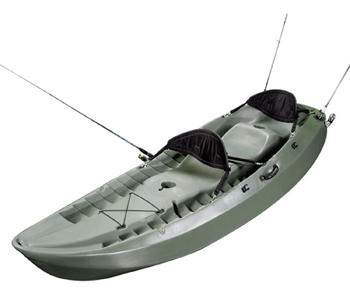 Extremely stable – the uniquely shaped hull coupled with the high density polyethylene body makes this kayak stable enough to sustain a standing fisherman. 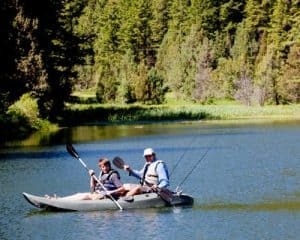 The stability makes it ideal for those individuals who are beginning to fish in rivers and aren’t great at balancing the sportier kayaks. Great tracking – the tunnel hull design allows the kayak to track well in the water. Focused on fishing – with several features specifically added for fishing such as rod holders, hatch, extreme stability, shock cord straps & ditty trays, this kayak is meant for those who want to fish on the river. Paddle cradles with their own paddle clips are also provided so you don’t have to worry about the paddles as you concentrate on fishing. Family fun – the 500 lbs. carrying capacity of the kayak doesn’t just make fishing for two people a breeze, it allows for water based family activities too. Although it works great for solo kayaking, the 60 lbs. weight of the kayak means it will be tough for a single person to take it from vehicle to water. It is recommended that even if you go solo kayaking, take a partner with you. The olive green color may create visibility problems in low light which can be hazardous if there are other craft in the water. 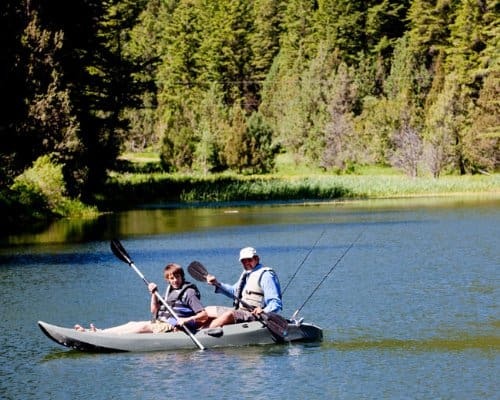 This lifetime kayak is moderately priced, extremely stable and fitted for fishing and leisure family adventures. For a family that is starting out in kayaking, this can be a solid purchase; it has glowing recommendations from past customers.